Murray Animal Hospital is able to provide you with a full pharmacy to complete the needs of your pets. All of your flea, tick and heartworm products are all 100 % gauranteed by the companies and veterinarian recommended. A key benefit of having all of our products stocked in house is it allows us to dispense them to you in 6 packs or monthly doses to better suit your family financially and conveniently. 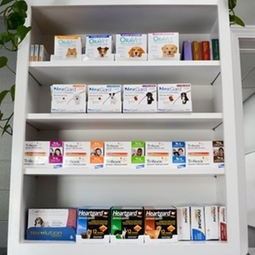 Our pharmacy is fully stocked with the medications your pet will need when prescribed as a treatment for their diagnosis. This allows us to provide you with quick prescriptions and refills. No waiting in a long line at a pharmacy for your pets medications.